It has actually happened, no way to turn back now. 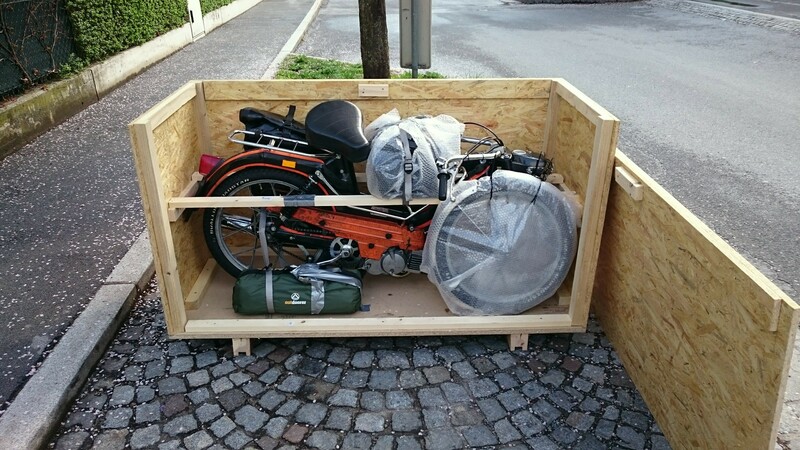 Not too long ago my Moped was picked up at home to be sent to Ulanbaataar and I will fly out in May to recover it from customs and drive back home. But lets go a bit back, why am I doing this? Okay lets make this short, in 2012 I bought the Puch Maxi and went on a Trip in Europe, it broke down, i fixed it but kinda always wanted to finish or redo that trip. In 2017 I finished my bachelors and had already been fascinated by these big Bike and Car travels you can find online, like the Mongol Rally for example and tried to redo the 2012 trip, but never started because the Maxi was in no good condition. In autumn I began planning, and inspired by the travels of Ed March at www.c90adventures.co.uk I came up with the current Route. And in April the Moped disappeared into a Truck heading to Mongolia. That's where things are right now, I got my flight, the Moped is on its way and I am just waiting for my Mongolian visa to arrive. Don't worry this is just a quick little update, a longer Article regarding my Preparations and the things before starting in Ulanbaataar will follow once I get my Moped from customs and everything is ready to start.